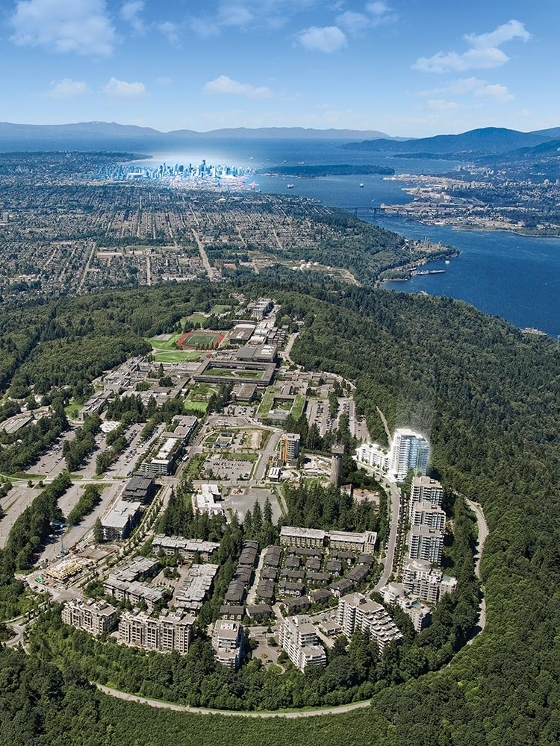 Over the next five years, the population at Simon Fraser University on Burnaby Mountain is expected to double to 10,000 residents, and campus stakeholders are aiming to tailor the area’s mix of commercial space to meet the needs of the emerging town centre. Underscoring the growth at SFU was the recent announcement by the B.C. government, Burnaby school district and SFU stakeholders to jointly fund another 195 new spaces at the University Highlands Elementary School to the tune of $3.9 million, according to a news release sent out by the SFU Community Trust in March. Another deal is nearing completion to build a 15,000-square-foot medical centre in the community, said Gordon Harris, the president and CEO of the SFU Community Trust. “That is certainly a missing ingredient,” Harris told The Sun in an interview. He said the community trust operates as a subsidiary to SFU with a mandate to develop and maintain the residential and commercial properties next to SFU campus, called UniverCity. While the current business mix appears to meet the needs of the community, Harris and the student government say more diverse services, restaurants and shops will be needed as the population increases. There are currently about 5,000 residents living in the UniverCity neighbourhood — a looping district next to campus with a mix of mid-rise and low-rise condos, townhomes and commercial buildings. There are about 1,300 homes in the UniverCity neighbourhood, but Harris said that will climb to roughly 4,500 by 2022. Harris said the proceeds of their residential and commercial developments flow back to SFU and the university’s foundation as an endowment that is used for teaching and research. The commercial components of the community are clustered along a two-block stretch called University High Street, with three mixed-use buildings that include a 23,000 sq. ft. grocery store, a B.C. Liquor store, restaurants, fast food and office space. “We’re trying to create a full range of food convenience-type merchandise to serve the local community, but also to serve the university population,” Harris said, noting that about 25,000 people populate the campus on a daily basis. As currently designed and leased, there seems to be a decent mix of food and retail to meet students’ needs, said Larissa Chen, the president of the Simon Fraser Student Society. “There is definitely a lot of growth and a lot of buildings being built,” Chen said, stressing that many students rely on the food services emerging along the University High Street in addition to the food available on campus proper. One pressing need is more banking options, said Chen, who has previously lived in the UniverCity neighbourhood. “We only have one bank on campus. … That was a barrier for a lot of student groups,” she said. Vancouver-based Macdonald Commercial Realty handles the leasing and management of the commercial buildings, which remain under the SFU Community Trust’s ownership. The High Street area really came to life in 2009 with the opening of Nesters Market, said Tony Letvinchuk, Macdonald Commercial’s managing director. There are currently three core mixed-use buildings in the area, including the fully leased Hub, home to Nesters, the nearly full 43,000-sq.-ft. Cornerstone building, and the new CentreBlock building, which is now leasing about 33,000 sq. ft. of commercial space on two floors. The opening of CentreBlock this year across the street from Nesters Market boosted services, Letvinchuk said, listing A&W, Chef Hung Restaurant, Uncle Fatih’s Pizza, Migoto Sushi and Chopped Leaf among their initial leases. “The Hub and Cornerstone buildings on University High Street are now virtually 100 per cent occupied, with a B.C. government liquor store opening their doors last year and Starbucks operating a prime location in Cornerstone since the fall of 2015,” said Barb Burrows, the leasing agent for the building for Macdonald. The Terry Fox Foundation headquarters is also located in the Cornerstone Building, she said. Harris said there are also plans underway to add a fourth mixed-use commercial building to the area. The building could help to fill in the commercial gaps in coming years, he said. “We think that as the community grows and matures, there’s a need for another restaurant, and when we get that restaurant, we’d like for it to be a little more upscale,” he said.